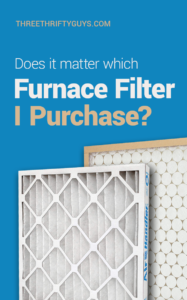 This is a question that has been bugging me for some time: does it even matter what type of furnace filters I purchase (can’t I just get the cheapest?) I posed the question to our good friend, Jessie, who worked as an HVAC professional and offered her expert take on the subject. Hope it helps! I was a HVAC service technician for over 11 years but now I am a stay-at-home Mom. I’m going to give a technical explanation and a non-technical explanation on what type of filters to use and how to figure it out. A master technician that furthered my training in 2002 explained furnace filters to me. But, here is my disclaimer: this post is just a generic know-how and always rely on your qualified HVAC technician to give you knowledge and do repairs on your own personal heating equipment. Each home is different and each installation is different making the technician physically working on your equipment the one who will know best! 1 What is your furnace filter for? 2 What kinds of disposable filters are there? 3 Which one should I use? What is your furnace filter for? Being diligent about changing your filter is key to the safety, longevity and efficiency of your equipment. Using the proper filter and proper size filter for your equipment is also important. Many manufacturers market their filters so that you believe that a filter is meant for your respiratory health, helping with dust mites and allergens. I don’t doubt that those filters can do that. Remember though, filters are designed for the protection of your equipment only. If you have indoor air quality issues or certain respiratory health issues there is special equipment one can purchase to help with those issues. Here’s how to tell when the water heater is going out in your home. What kinds of disposable filters are there? There are many on the market. There are the inexpensive blue/white fiberglass filters all the way up to disposable accordion style filters that cost around $50 each. Some of the low-fold accordion style filters restrict too much air flow because of not having enough surface area for the air to be pushed through. Some of the accordion filters have a lot of folds giving plenty of surface area for air movement but those seem to be the costly filters that still need to be checked/changed every 30 days. My question for you is: how bad do you want to know that answer? If your answer is badly, then there are some tests that your qualified HVAC technician can do in your home to tell you. 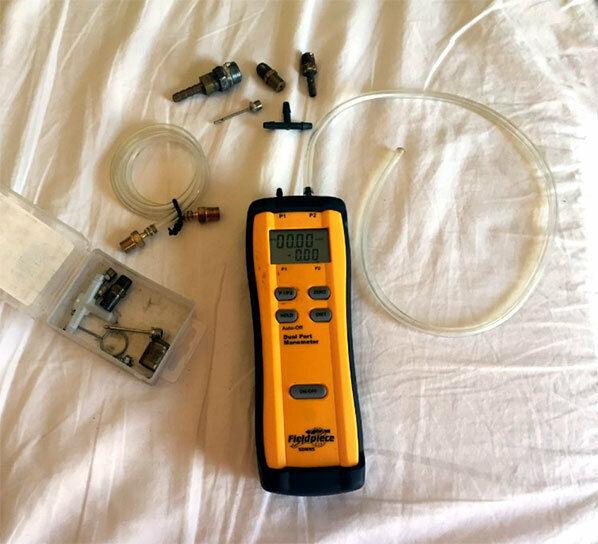 Your technician can take some simple air flow readings using a manometer. I used a manometer to measure air pressure in duct work, gas pressure in gas piping, and it can also tell me the difference in pressure between two places in your duct work. Here is my cheat sheet that I used for 11 years. It stayed with me in my tool box and was at my fingertips when I needed it. And yes, there are people with high efficiency DC blower motors on their equipment, and yes they can ramp up and sort of compensate for dirty or restrictive filters, but why make your equipment work that hard especially when you bought it with efficiency in mind! 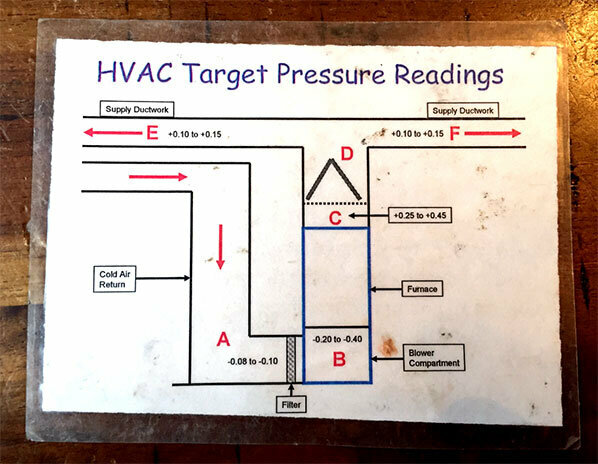 Your technician can take air flow at letter A and letter B, and if they aren’t in the parameters stated on the cheat sheet it’s time to look at what the problem is. If you really want to go the extra mile, buy 3 different kinds of filters and take readings with each one of them at a time in the filter slot. Also think about having a layer of dirt on them. If a clean filter is on the border of not being in the parameters, then most likely it being dirty will make it out of specs. Meaning if the air pressure readings with the clean filter are close to being not in the parameters of what the ideal readings should be on the cheat sheet, then most likely with that filter being dirty or slightly dirty, it will make it not in the parameters. Your technician can check to make sure your blower speed is set correctly and duct work is not over or undersized. Okay, so let me get out of tech talk. I live in the country, windows are open, clothes flapping out on the line drying, dog and two active boys are running in and out of the house. My filter is changed 2 times a month and I buy the cheapest fiberglass filter I can find. We have a lot of dirt. Plain and simple. I also do a tune-up and cleaning once a year – not only for cleanliness – but for safety. You should too, but call for a qualified technician. I know that the cheap fiberglass filter will allow enough air flow, catch the clogging chunks, won’t make me broke, and a cleaning every year will take care of the pesky fine particles. Since we don’t suffer from allergies, there is no need to have any extra filtration equipment. A friend of mine lives in the suburbs and has no kids, no animals, lives by himself, doesn’t open windows and has low use of equipment (part of the year he is gone on business). He uses an accordion style filter with a lot of folds and only changes it 2 times a year! It works perfectly for him. He also gets a tune up / cleaning every year, not so much because of dirt, but for safety. I found that the low-fold accordion filters tended to be restrictive, even being brand new right out of the wrapper. I am sure there are a lot of neigh sayers but the manometer doesn’t lie. Change/check whatever filter you choose often, at least every 30 days. Always have a qualified HVAC Technician to work on, repair and install your equipment. For safety sake get a tune up / cleaning every year. What kind of filters do you use in your furnace? Some of the links on this page are affiliate links – to which TTG may earn a commission on, at no cost to you. I just replaced my 2.5 ton, 30 year old Carrier AC unit with a 3.0 ton Carrier AC unit. I took three different bids. The company that got my bid was so much more detail oriented from the start. He was the only one that looked up my exact square feet from the county records. The other two companies bid on a 2.5 ton, which was the wrong size for my home’s needs. He told me that I should use the cheaper fiberglass filters and explained exactly what your article explained. Thank you for this perfectly timed and detailed explanation! I am going to return a 4-pack of pleated filters to Sam’s Club and start buying the blue ones that I did years ago when I had to be very frugal. I plan on replacing the blue filter every month. I will have to put it on my calendar just like any other important reminder. Glad the info was helpful Jeannie! Great post. Over the winter, our home felt unusually cold and I noticed we weren’t getting much air flow out of the vents. The furnace was operating, but airflow was minimal. I called an HVAC company, expecting the worst. Turned out that changing to a really cheap furnace filter that allowed better air flow was the solution. I had bought into the hype about allergens and thought I was doing the right thing for our family by buying the expensive filters, but I was damaging our furnace. Interesting. These expensive filters that promise the world seem to be all (mostly) marketing hype.